Back in the summer, on one of the hottest day’s of the year and lacking garden space as well as a BBQ; me and my boy decided to go out for dinner. I’d been reading foodie blogs like mad and gave him the choice of two BBQ style belters to pick from. 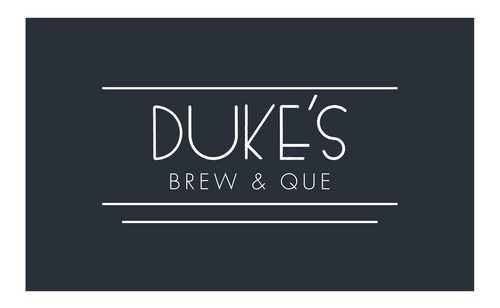 Beard to Tail near Old Street or the lesser known Dukes Brew and Que in Haggerston. I reckon by the title of this post you can work he chose? Just around the corner from Haggerston Overground it’s a bit awks to get to and possibly a bit ‘too East’ for some. Luckily though, lovely boyfriend is a bona-fide black cabbie (could I have picked more of a Cockney?! )- so no where far corner of London is too awkward for us to get to and, for me anyway, he always takes the quickest route! 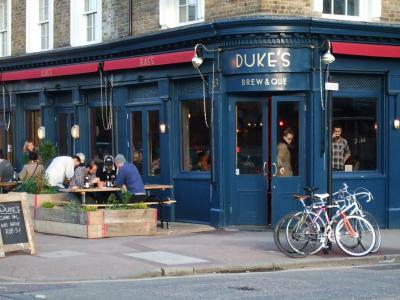 Anyway – we walked into the decidedly cool and trendy Dukes with BIG expectations. Mainly for the ribs which had been raved about online. We took a seat at a wobbly little table for two and inhaled the smokey goodness emanating from the kitchen. A quick scout of the menu and we decided to order too much and share it all. We salivated to the waitress and she came over and took our order of a rib platter, chicken wings, macaroni+cheese and of course a side of chips (hey fatties!). Did Dukes deliver on the expectations? Ummm and some! 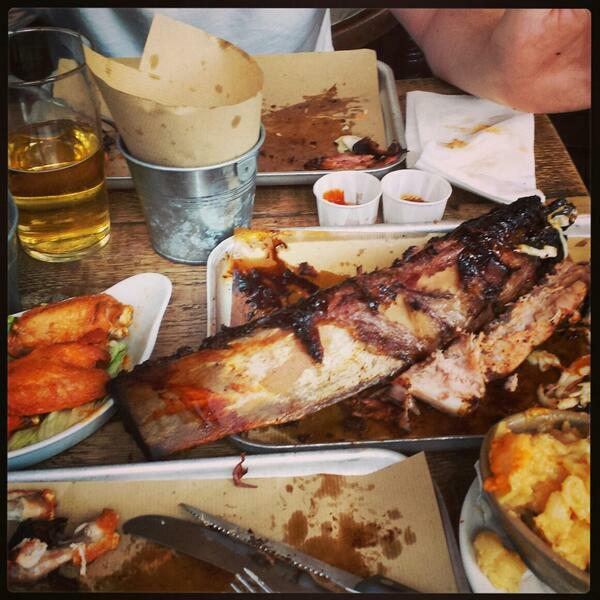 When our ribs arrived I couldn’t believe how big they were!! Literally the size of my arm. One was so big that a guy from a table outside spotted it, stood up, pressed his drooling face up against the window and then beckoned excitedly to the waitress so that he too could have whatever it was that had just arrived at our table. In addition to the giant ribs we had the most delicious pulled pork on our platter – so good, I personally didn’t think there was enough of it. The chicken wings were also really good but after the ribs and pork you couldn’t really compare them and they definitely were more of a supporting role. The macaroni and cheese? Probably a bit unnecessary all things considered but my mild major cheese addiction panicked me into ordering it. Next time though I can relax in the knowledge that the meat will more than satisfy. I guess the only downside to Dukes is that it is kind of pricey – I mean then rib platter was around £25 and a single caveman probably could eat it all to himself? But I’m certainly a cost and worth kinda gal and this cost was totally worth it. The service was lovely, the surroundings were comfy and chilled and the food well you know what I thought about that. If I were you reading this, I’d make it my mission to navigate there and order a rib feast of my own ASAP!